A while ago, I discovered this recipe for a DIY cheek stain from ReadyMade, and I thought, “I should make that!” Then I read the ingredient list. You guys, I hate beets. I really, really hate them. I hate them so much that the thought of purchasing a beet, then having to peel it and chop it and smell it…grossed me out. Finally, I could no longer stand the thought of being reunited with a natural version of Benetint, so I went to Healthy Home Market, bought two (!) 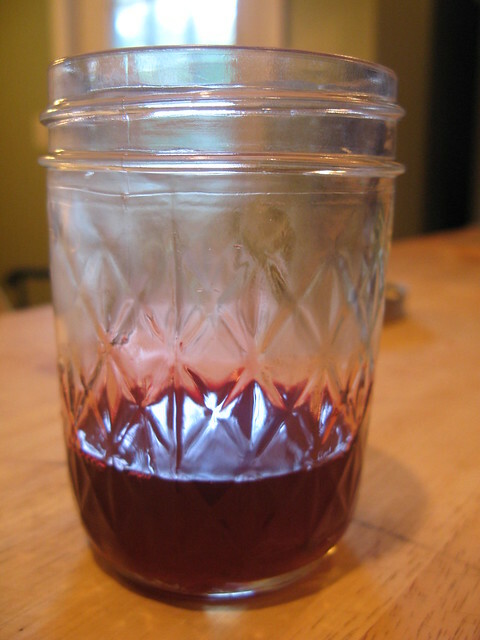 beets and some vegetable glycerine–and wow, do I love this stuff. Read on for the recipe and more photos! Peel the beet(s) and chop them into large pieces. Put the beets and about two tablespoons of vegetable glycerine into a double boiler (or a bowl inside a pot like I did), and heat the water to a gentle boil. You can add a little extra veggie glycerine if you use two beets–I probably used four tablespoons. Cook the beets for 15 minutes, watching to be sure the water doesn’t evaporate or boil over. Strain out the beet pieces, and collect the liquid in your jar. Make sure to let it cool before you dab some on your cheeks! The stain should keep for about six months. I must try this! I too was in love with Benetint. Actually, I’m a fan of any tinted makeup specifically because it tends to last a while and isn’t sticky. I loathe sticky cosmetics. Yet another reason the wear natural makeup. I especially like using a tint on my lips so I can use my favorite lip balm overtop. I’ll be making my own for sure. Thanks for sharing! I am so glad you joined my link party, I really love finding new natural beauty blogs! I am not there yet, but I am trying!!! I just found this blog a couple of weeks ago (love it!) and when I came across this post, I knew I had to try it. My Benetint was nearly gone so the timing was perfect. I LOVE this cheek stain! It was super easy and waaaaayyy less expensive than Benetint. The recipe made enough to refill my Benetint bottle, plus some. I gave the extra to my sister in an empty nailpolish bottle that I bought at the beauty supply. Thanks for the post! Did you know you can also use beet powder? You dissolve it in heated glycerine. It can *sometimes* be grainy but is generally OK.
Do you dissolve the powder right into the glycerin and cook? Or do you need to add water to the powder first? How much powder to glycerin? trying this right now! i had this idea a little while ago, and i came across your site when i started doing research 🙂 i’ve been using plain beets on my cheeks(hehe) straight off the beet, but this is will make it more portable, last longer, and use the beet better i think. i will update you after it cools, they are almost ready to strain! I bought 3 kinds of organic powders, and one of them is beetroot, so I was looking for a recipe for a cheek and lipstain, because I wanted to buy Formetera from Tilbury, but I gave up my master card before I bought it…so, now I’m left to “experiment” – making my own!